Herald of the Jewish Enlightenment. 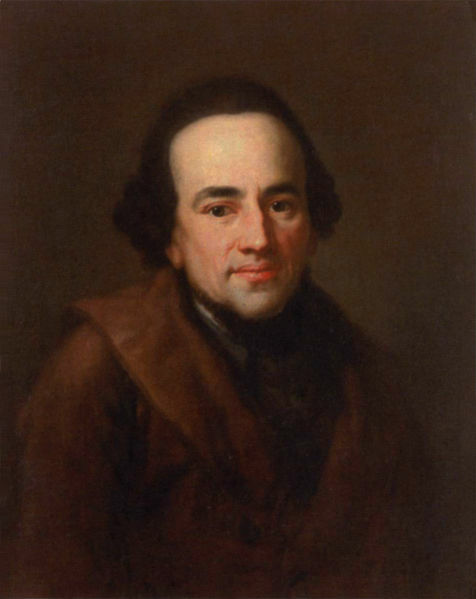 In his classic work The Course of Modern Jewish History, Howard Sachar argues that Moses Mendelssohn–although “neither a great philosopher nor a penetrating theologian, nor even a Jewish spokesman of exceptional courage”–was the herald of Jewish Enlightenment and the most important figure in early modern Jewish history. If Mendelssohn’s intellectual legacy and political impact were indeed meager, how has this unprepossessing, humpbacked figure attained almost mythical status as the hero of Jewish modernization and progress or–depending on your point of view–as the herald of assimilation and the breakdown of Jewish tradition? Moses Mendelssohn was born in Dessau (now in eastern Germany) into a traditional ghetto family–his father was a Torah scribe. Mendelssohn received a thorough Jewish education, studying with David Frankel, the rabbi of Dessau and an important intellect in his own right. When Frankel was appointed chief rabbi of Berlin, Moses, then aged 14, followed him there on foot in order to continue his education. Once in the Prussian capital, he exploited its intellectual resources to the full, studying with the city’s few “enlightened” Jews and gaining a thorough grounding in philosophy, Greek, and German language and literature. Late 18th century Berlin was not a friendly place for Jews. Emancipation and equal rights were decades away and only wealthy, economically useful Jews were permitted to reside in the Prussian capital. Most Christians saw Jews as alien and primitive. Even among intellectuals, those few Jews who had managed to acquire a modern education were regarded as exceptions to the rule. At first Mendelssohn’s work concentrated on general philosophical and German literary themes. In Phaedo, his most important philosophical piece, for example, Mendelssohn offers arguments for the existence of God and the immortality of the soul, but in Western philosophical terms rather than Jewish ones. At the same time, Mendelssohn published a number of Hebrew writings, primarily attempts to bridge the gap between Jewish thought and contemporary philosophical ideas. Focusing on building his literary career and intent on gaining acceptance in Christian intellectual circles, Mendelssohn tried to give his Jewish identity a low public profile. Yet the growing incomprehension of many Christian intellectuals of how a cultured, sensitive person like Mendelssohn could remain loyal to an obsolete religion eventually forced his hand. In 1769, Johann Caspar Lavater, a Lutheran minister who had met and been impressed by Mendelssohn, challenged him either to refute the truth of Christianity or, if this was impossible, to act on his conscience and be baptized. Mendelssohn responded that Judaism’s inherent religious tolerance prevented him from criticising other people’s spiritual convictions and, that as a member of an oppressed minority, it would be unwise of him to engage in religious disputations. Even though he avoided answering Lavater’s theological charges, the incident profoundly upset Mendelssohn and perhaps pushed him in the direction of increased Jewish involvement. From the 1770s, Mendelssohn began to exploit his celebrity status to intervene on behalf of Jewish communities facing restrictions, discrimination and expulsion orders. Following the French revolution he became involved in the debate over Jewish rights, urging his colleague Christian von Dohm to write what became the manifesto for Jewish emancipation, On the Amelioration of the Civil Status of the Jews. Perhaps Mendelssohn’s most significant contribution to Jewish life was his pioneering translation of the Torah into German. The work was intended, according to Mendelssohn, to provide a “first step towards culture” for the Jews; in other words, to wean them off Yiddish and teach them German while enabling them to read the Bible in the context of the Jewish, rather than the Christian, interpretive tradition. However, what guaranteed Mendelssohn’s place in the canon of modern Jewish thought was his book Jerusalem, or On Religious Power and Judaism, published in 1783. In this polemical work Mendelssohn strives to demonstrate that Jewish faith is compatible with good citizenship, and that traditional Judaism is a rational religion, consonant with the values of the Enlightenment. In particular, Mendelssohn is keen to show that Judaism has no element of coercive authority in order to dispense with the accusation that Jews in modern society are inevitably torn between compliance with the demands of their faith and obedience to the civil authorities. But in making this claim, Mendelssohn runs into a problem: how to argue against religious compulsion without undermining the necessarily obligatory basis of Jewish law. Mendelssohn starts out by distinguishing between revealed religion and revealed legislation. Judaism, as opposed to a revealed religion such as Christianity, comprises only revealed legislation–laws which govern behaviour–and as such is free of dogmas or mandatory beliefs. Mendelssohn believes that God has provided the means for us to apprehend philosophical and scientific truths via our innate powers of reason and observation. All human beings, not only Jews, can grasp these truths, without recourse to a holy text (the exception to this rule is historical truths, which can only be communicated to us by a reliable witness–hence the Torah’s focus on historical narrative). The need for revealed dogma suggests that innate human reason might be unable to grasp these truths and casts doubt on the perfection of creation, and thereby on God’s omnipotence. For this reason, Judaism mandates only actions, not faith. According to Mendelssohn even the laws of Judaism have a non-coercive character. As a proto-liberal thinker, Mendelssohn believes that religions have no right to compel human beings to act in certain ways. The State’s right of coercion is not based on the innate authority of the government, but rather derives from the social contract. The State can make demands on its citizens is in order to preserve their rights. For example, my right to life–which derives from my need of life–imposes a concomitant duty on my fellow citizens not to kill me, and the State’s role is to guarantee this right, using coercion if necessary. But an omnipotent God by definition has no needs, and therefore has no rights. Duties towards him cannot be understood in terms of a contract; rather, they derive from love of God. Religion therefore lacks the contractual basis for the legitimate exercise of coercion. The question of religious observance becomes a matter for the individual believer. Moreover, if the goal of religion is to boost morality by influencing people’s beliefs and values, it’s clear that this can only be achieved through persuasion and argument, not by force. Yet despite having lost its coercive authority, Judaism has not lost its meaning. Even though revelation does not directly impart philosophical or scientific truths, Mendelssohn believes that the laws of the Torah indirectly point to these eternal verities. While there is no one-to-one correspondence between particular mitzvot and specific insights into truth, the framework of halakhah is designed to push us into relationships with teachers and rabbis and to stimulate us to contemplation, learning and instruction. If Judaism is still meaningful, it also has binding authority (in terms of individual conscience, of course). The Torah was given to the Jewish people at Sinai (for proof of this Mendelssohn relies on the medieval argument that the testimony of 600,000 people who witnessed the revelation can’t be wrong–ignoring the fact that the only evidence for the existence of these witnesses is the very narrative which their testimony is supposed to corroborate). As such, the Torah is to remain in force until God publicly abrogates it. Therefore Christians should not only desist from proselytizing, they should demand that Jews follow their conscience and remain true to their tradition. Mendelssohn’s argument pushes in two directions simultaneously. On the one hand, he argues for the liberalisation of Judaism, grounding it in universal rationalism and calling for the abolition of the religion’s coercive authority. On the other, he calls on Jews of good conscience to remain observant and to be faithful to the tradition. Perhaps for this reason, Jerusalem attracted very little support in its own time. Maskilim (“enlightened,” modernizing Jews) objected to its affirmation of halakhah, whereas the orthodox could not accept the dismissal of religious coercion. Mendelssohn found himself caught in the dilemma subsequently experienced by every thinker who has attempted to synthesize Judaism and liberalism. While rationalist apologetics are essential if Judaism is to be made relevant, the rationalist argument ultimately implies that the tradition should conform to a new source of authority–reason. This paves the way for a process of selection, in which those aspects of Judaism which don’t make sense in modern terms are simply filtered out. The Torah’s unity and authority are thereby irrevocably damaged. Perhaps this explains why Mendelssohn ultimately held back from the logical conclusions of his rationalist critique: the authority of Judaism can be upheld not in terms of reason, but on the basis of faith. A teacher, writer, and community leader who helped to shape modern Orthodoxy in America. Theologian who emphasized the ethical center of Judaism.